The mission of Far West Wheelchair Athletic Association (FWWAA) is to develop, promote, and organize community based sport and recreation programs for individuals of all ages with various physical disabilities. Since 1968 FWWAA has supported a philosophy that focuses on the ability, not the disability of an individual. We provide the tools necessary to help our athletes develop independence as well as a positive self-image. FWWAA fosters these ideals through physical activity by offering the same movement opportunities as their able-bodied peers across the lifespan. Through our programs, athletes have an opportunity to increase their social, psychological and physical well-being. These programs include individual and team opportunities, camps, clinics, and competition at the regional and national level. FWWAA programs cater to a wide array of individuals with physical disabilities. These physical disabilities include but are not limited to cerebral palsy, spina bifida, spinal cord injury, traumatic brain injury, amputation, visual impairments, muscular dystrophy, and other neuromuscular impairments. FWWAA strives to increase community awareness of programs and opportunities for individuals with physical disabilities by working with local businesses, schools, government and other public sectors to increase community engagement. 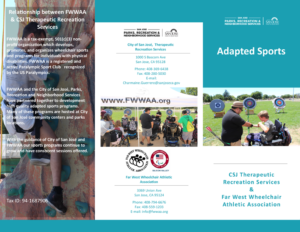 FWWAA is a tax-exempt, 501(c)(3) non-profit organization which, in partnership with the City of San Jose Therapeutic Recreation Services, develops, promotes, and organizes wheelchair sports and programs for individuals with physical disabilities. It is a sanctioned Chapter of Adaptive Sports, USA (ASUSA). FWWAA was incorporated in 1968, and operates under the guidance of an Executive Board of Directors. FWWAA is recognized by the U.S. Paralympic Committee as Paralympic Sport Club Silicon Valley, and has additional support from the City of San José, Department of Parks, Recreation and Neighborhood Services. Over the past five decades, FWWAA has provided thousands of sport opportunities for persons with disabilities. These opportunities include: Recreational sport programs, competitive teams for children and adults in track and field, aquatics, archery, basketball, rugby, tennis and powersoccer. FWWAA has served as host for regional and national competitions including the National Junior Disability Championships, National Wheelchair Basketball Association Final Four, and Paralympic Track and Field Qualifier. Since 1983 FWWAA has run the annual Northern California Junior Sports Camp, a residential, multi-sport camp for 5-21 year-olds who have physical disabilities.